Dr. Amitava Ghosh was recently in Hyderabad to deliver the Second K Mahipathi Rao Memorial lecture at the Shilpa Kala Vedika. The lecture was organized by KMR Foundation and the Sreenidhi International School Management. Dr. Ghosh is the author of the much acclaimed book ‘Glass Palace winner of the Grand Prize for Fiction, Frankfurt eBook Award 2001. It was as if history came alive that morning through his vivid portrayal of the Long March out of Burma in 1941-42. Many in the audience were unaware that millions of Indians had travelled over a thousand miles of rough terrain over high mountains, dense forests, in freezing cold or pouring rain to reach the safety of their native soil – India. Seven decades earlier, when Japan overran Burma and bombs shattered Rangoon- a mass exodus resulted. Dr. Ghosh had conducted extensive research towards the writing of this novel especially on the Long March. 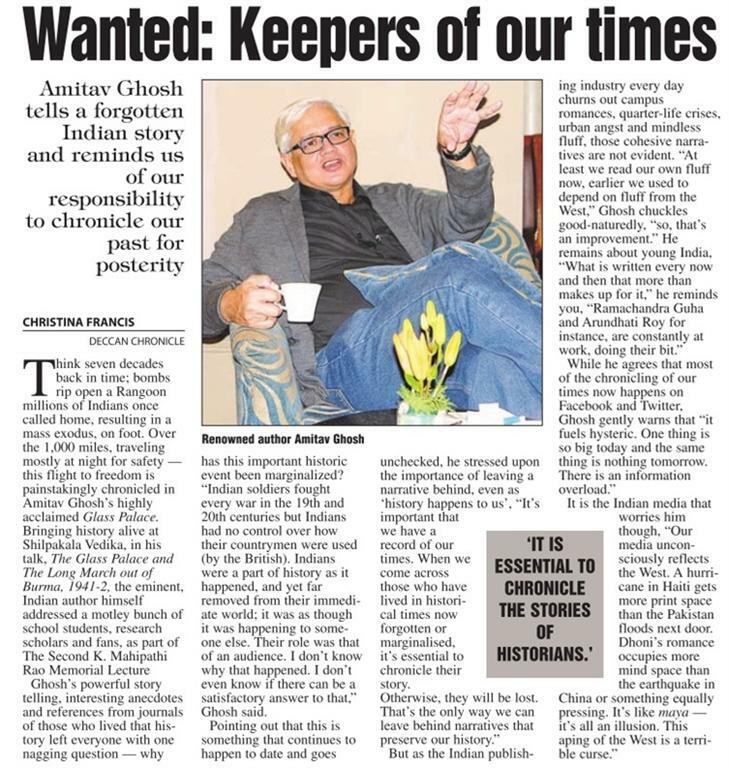 Surprisingly he found the Indian chronicles strangely silent on this important historic event. There was also an absence of individual memoirs of this event till he came across a journal of about thirty pages left behind by a doctor serving in Burma at the time of Japanese occupation. Dr. Ghosh backed this powerful and heart wrenching story by referring to interesting anecdotes from this journal written by someone who had undertaken this journey while escaping from war torn Burma. Interestingly, what remained uppermost in his memory was not the hardships and travails of his long and arduous journey but the racism that he experienced at the hands of his British fellow travelers. Dr. Amitava Ghosh’s powerful narrative threw a nagging question the audience – why has this important historic event been marginalised? To quote him “Indian soldiers fought every war in the 19th and 20th centuries but Indians had no control over how their countrymen were used by the British. Indians were a part of history as it happened, and yet far removed from it…. Their role was that of an audience…” Is it the gap in passing on information between generations or just a lack of a sense of history? With this he reiterated the importance of leaving a narrative behind, even as ‘history happens to us’. It is important to have a record of our times, chronicle the stories of those who have lived through important events so as to maintain an unbroken link with our past. He could not help taking a dig at the Indian publishing Industry which churns out mindless stuff on celebrity romance and junk spiritual tips or the television channels that are abuzz with Bollywood news but shies away from recording epoch making events. Indians live in history but absent themselves from history……We owe it to the future generations to chronicle our past for posterity.